Giving The Gift of Build-A-Bear Workshops this Valentine's Day! Valentine's Day is for just about everybody celebrating a loved one these days. There are so many different gift ideas available why not give the gift of Build-A-Bear Workshop and give them a gift along with an experience they will always treasure. Build-A-Bear Workshop is the only global company that offers an interactive make-your-own stuffed animal retail-entertainment experience. There are more than 400 Build-A-Bear Workshop stores worldwide including 14 stores in Canada throughout the GTA, one in Dartmouth, Ottawa, London, Niagara Falls, Edmonton, Saskatoon, two in Calgary, Winnipeg and one in the Greater Vancouver Regional District. We were first introduced to Build-A-Bear Workshop several years ago when our oldest daughter received a bunny for her birthday from her cousins. They had visited the Build-A-Bear Workshop and decided to get a custom made bunny for my girl. She loved it and still tells the story of how she got it to this day, she calls it "Miss Bunny". There are a wide variety of lovable furry friends available at Build-A-Bear Workshop to make the perfect gift for your one in a million. You can choose to go in to an actual Build-A-Bear Workshop or you can choose online to purchase just a bear or a bear with clothes and accessories! Choose from Big Hearts Bear decked out in Valentine's wear or Big Top Bearemy who is ready for a Valentine's date ($23 each)! Tons of Love Elephant and Huge Hearted Lion ($25 each), Happy Hugs Teddy and Pawlette Coufur ($19 each) are also decked out for this day of love! 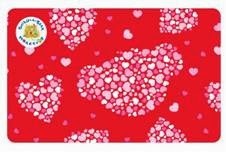 Pink Hearts Hello Kitty is also a great choice for Valentine's Day! You can add the realistic feel of a heartbeat to any furry friend for only $6.50*. Build-A-Bear Workshop also has special Disney Princess bears in Rapunzel, Sleeping Beauty and Cinderella from $19. Limited Edition Build-A-Bear smallfrys are pre-stuffed pals you can gift to show someone just how much you care. There is Be Mine Bear, Hugs-A-Plenty Puppy or XOXO Kitty available for $11 each*. Give the gift of the Build-A-Bear Workshop Experience and memory that lasts a lifetime with a Bear Buck$ Gift Card. Cards are available in a variety of designs and can be purchased for any amount. They are also available online along with bears and accessories. Build-A-Bear Workshop is not just for kids, the bears available are beautifully created, have soft fur and trendy accessories for just about any occasion. We decided on Big Hearts Bear and Big Top Bearemy (pictured above) all dressed up and ready for their Valentine's day date! These will make wonderful gifts for our two oldest kids this Valentine's Day! I know they will love them as much as I do! Learn more about Build-A-Bear Workshop by visiting the website and follow along on Twitter @BuildABear and Like the Build-A-Bear Facebook page for updates! Posted on behalf of Build-A-Bear Workshop. Complimentary product was supplied. Opinions and comments are those of the author.